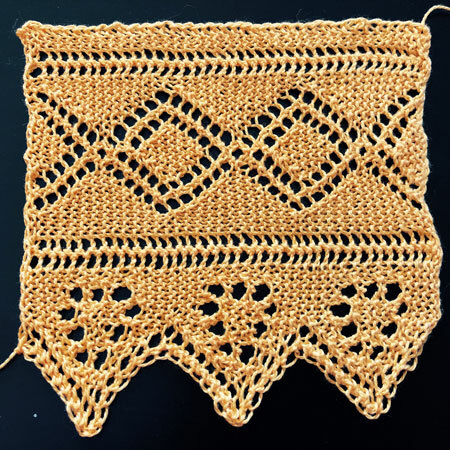 This pattern is an adaptation of one that appeared in the Queenslander on January 6th, 1917. I have made major changes to the diamond section to make it flow more naturally from one repeat to the next. 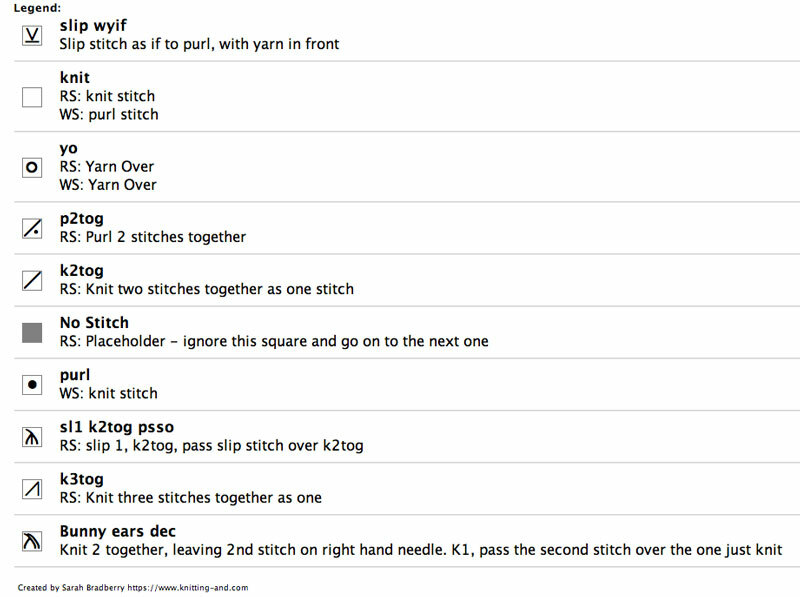 Sl1 wyif = slip 1 stitch purlways with the yarn held at the front of the work, as if you were going to purl the stitch. bunny ears dec = This is a decrease that turns 3 stitches to 2. K2tog leaving second stitch on right needle. Knit third stitch. Pass second stitch over third stitch. Here is a video that shows how to work it. Cast on 35 stitches and knit one row. Commence from row 1. Row 1 (WS): Sl1 wyif, k3, yo, p2tog, k2, [yo, k2tog] twice, k5, [k2tog, yo] twice, k3, yo, p2tog, k7, yo, k2 (36 sts). Row 2: Yo, k2tog, k8, yo, p2tog, k18, yo, p2tog, k4. Row 3: Sl1 wyif, k3, yo, p2tog, k3, [yo, k2tog] twice, k3, [k2tog, yo] twice, k4, yo, p2tog, k8, yo, k2 (37 sts). Row 4: Yo, k2tog, k9, yo, p2tog, k18, yo, p2tog, k4. Row 5: Sl1 wyif, k3, yo, p2tog, k4, [yo, k2tog] twice, k1, [k2tog, yo] twice, k5, yo, p2tog, k9, yo, k2 (38 sts). Row 6: Yo, k2tog, k10, yo, p2tog, k18, yo, p2tog, k4. Row 7: Sl1 wyif, k3, yo, p2tog, k5, yo, k2tog, yo, sl1-k2tog-psso, yo, k2tog, yo, k6, yo, p2tog, k3, k2tog, [yo] twice, k2tog, k3, yo, k2 (39 sts). Row 8: Yo, k2tog, k6, p1, k4, yo, p2tog, k18, yo, p2tog, k4. Row 9: Sl1 wyif, k3, yo, p2tog, k6, yo, k3tog, yo, k2tog, yo, k7, yo, p2tog, k1, [k2tog, [yo] twice, k2tog] twice, k2, yo, k2 (40 sts). Row 10: Yo, k2tog, k5, p1, k3, p1, k2, yo, p2tog, k18, yo, p2tog, k4. Row 11: Sl1 wyif, k3, yo, p2tog, k7, yo, bunny ears dec, yo, k8, yo, p2tog, k7, k2tog, [yo] twice, k2tog, k1, yo, k2 (42 sts). Row 12: Yo, k2tog, k4, p1, k8, yo, p2tog, k19, yo, p2tog, k4. Row 13: Sl1 wyif, k3, yo, p2tog, k7, k2tog, yo, k2tog, k8, yo, p2tog, k1, k2tog, [yo] twice, k2tog, k7, yo, k2tog, k1 (41 sts). Row 14: Yo, k2tog, k10, p1, k2, yo, p2tog, k18, yo, p2tog, k4. Row 15: Sl1 wyif, k3, yo, p2tog, k7, yo, bunny ears dec, yo, k8, yo, p2tog, k7, k2tog, [yo] twice, k2tog, k1, yo, k2tog, k1 (42 sts). Row 16: Yo, k2tog, k4, p1, k8, yo, p2tog, k19, yo, p2tog, k4. Row 17: Sl1 wyif, k3, yo, p2tog, k5, k2tog, [yo, k2tog] 3 times, k6, yo, p2tog, k1, [k2tog, [yo] twice, k2tog] twice, k1, k2tog, yo, k2tog, k1 (40 sts). Row 18: Yo, k2tog, k5, p1, k3, p1, k2, yo, p2tog, k18, yo, p2tog, k4. Row 19: Sl1 wyif, k3, yo, p2tog, k4, k2tog, yo, k2tog, yo, k1, [yo, k2tog] twice, k5, yo, p2tog, k3, k2tog, [yo] twice, k2tog, k2, k2tog, yo, k2tog, k1 (39 sts). Row 20: Yo, k2tog, k6, p1, k4, yo, p2tog, k18, yo, p2tog, k4. Row 21: Sl1 wyif, k3, yo, p2tog, k3, [k2tog, yo] twice, k3, [yo, k2tog] twice, k4, yo, p2tog, k5, k2tog, k1, k2tog, yo, k2tog, k1 (37 sts). Row 22: Yo, k2tog, k9, yo, p2tog, k18, yo, p2tog, k4. Row 23: Sl1 wyif, k3, yo, p2tog, k2, [k2tog, yo] twice, k5, [yo, k2tog] twice, k3, yo, p2tog, k6, k2tog, yo, k2tog, k1 (36 sts). Row 24: Yo, k2tog, k8, yo, p2tog, k18, yo, p2tog, k4. Row 25: Sl1 wyif, k3, yo, p2tog, k1, [k2tog, yo] twice, k7, [yo, k2tog] twice, k2, yo, p2tog, k5, k2tog, yo, k2tog, k1 (35 sts). Row 26: Yo, k2tog, k7, yo, p2tog, k18, yo, p2tog, k4. 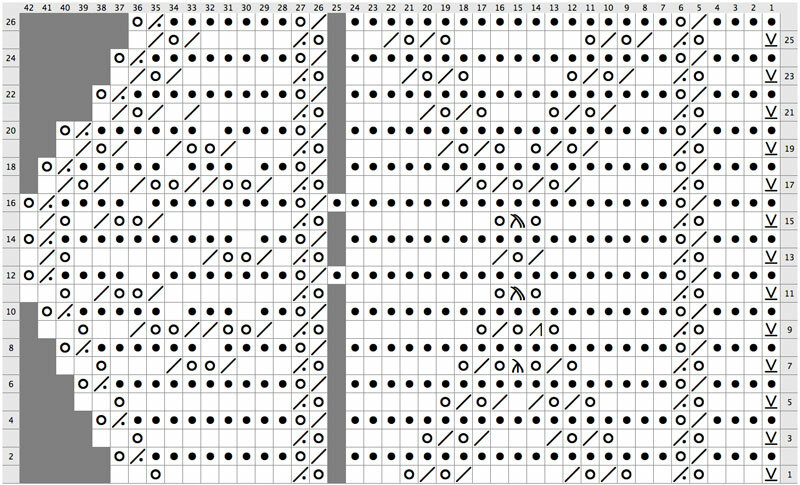 Rows 1 to 26 form the pattern. Repeat for the desired length.